The wild horses and burros that are part of the federal Bureau of Land Management’s latest adoption effort were notably calm Friday as they moved slowly in the early afternoon heat. The mustangs were looking for a new home, and their potential owners were looking for more than just a pet. About a dozen people sized up the 20 wild horses and 24 burros in a makeshift pen at the Meadowood Recreation Area in Lorton — offering grass to the animals to see which were friendly. Some people were there ahead of Saturday’s adoption event looking for a gentle companion that a child could ride; others came just to admire the animals. Bill Blake, 65, probably isn’t ready to adopt one right now — maybe next year, he said. But to him, mustangs are a pure animal, a sight worth coming from Culpeper, Va., two hours away. Saturday’s event — which is first come, first served and begins at 8 a.m. — is one of about two dozen adoptions being held by the bureau during the second half of this year. Adoptions are held at a variety of locations across the country in addition to online. 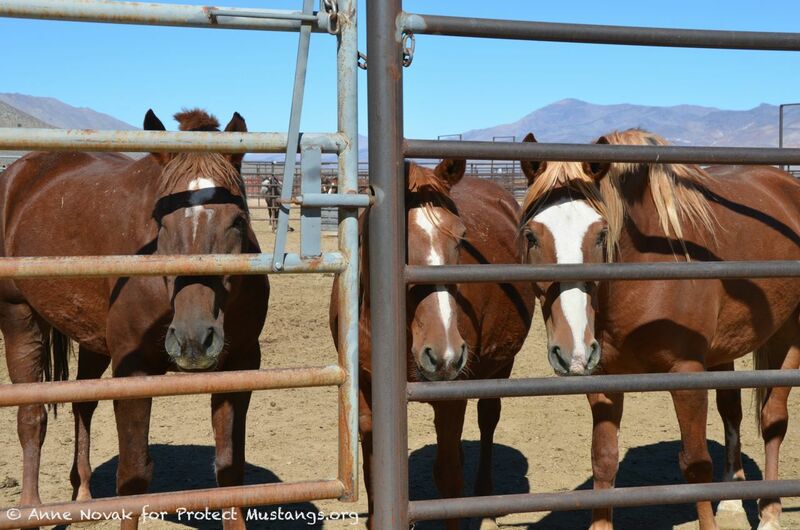 It’s just one of the ways the federal government is working to contain the burgeoning population of mustangs and burros in the western United States. As of March, according to bureau’s Web site, there were more than 58,000 horses and burros living on wild lands of 10 Western states in an area that can handle only about 26,700 animals. Contraception and adoption, among other methods, are used to curb population growth, said Davida Carnahan, who works with bureau’s Eastern States office. Crowded federal lands don’t just harm the other wildlife, Carnahan said: In the long-term, the area can run out of food and end up harming the horses. Adoptions cost about $125 per horse, but not just anyone can leave with one. Adopters must be at least 18 years old and have an enclosed facility with food, water and at least 400 square feet per animal. And, a year after the adoption, a bureau official must check up on the animal to ensure that it’s healthy. But taking in a mustang is a project: It needs to be taught to trust humans. For Kimberly Loveless, a horse lover and trainer from Fredericksburg, the difference between owning a wild horse and a domesticated horse is patience. Loveless has adopted five mustangs and is a volunteer for the program. Wild horses, which rarely have any human contact in nature, are generally terrified of people, she said, and it takes considerable time to gain their trust. But for Loveless, befriending a wild animal has been one of the most rewarding experiences of her life. “Just to see some of the horses when they’re wild — nobody’s brushed them, nobody’s trimmed their manes and nobody’s cleaned them up — if you can just kind of look past that and see what’s in their eyes and what’s in their faces, you know, and maybe find something special about one of them, it’s worth every bit of your time and effort,” Loveless said. Another trainer, Steve Mantle, has a Wyoming-based private horse-training facility: Mantle Ranch. Mantle, 58, often trains horses for the bureau’s program and said that making a mustang comfortable around people — or “gentling” them — can take from days to weeks. People need to be ready to put in the work when they adopt a wild horse, he said. It’s “not the quantity of horses adopted, it’s how many horses stay adopted,” Mantle said. Still, what if the horses were better off in the wild? Anne Novak, the executive director of Protect Mustangs, a wild horse advocacy group, said the federal government misrepresents the need to remove mustangs from their natural habitat, and she questions the agency’s head count of animals as well as its estimate of how many horses the land can support. The Wild Free-Roaming Horses and Burros Act of 1971 protects mustangs from harm and capture, although the law does allow the government to remove “excess animals” if they are damaging an environment. Although Novak’s organization isn’t against adoption, it says that when that’s not necessary, the horse should remain in the wild. Ultimately, the debate over the best place for these horses – in the wild or with people – boils down to a question that’s hard to get a firsthand answer for: Which would the horse prefer? Cross-posted from the Washington Post for educational purposes. The original article is here. This entry was posted in Uncategorized and tagged adoption, Anne Novak, Burros, environment, Mantle Ranch, Mantle wild horses, Mustang, Protect mustangs, Steve Mantle, Washington Post, wild horses by Protect Mustangs. Bookmark the permalink.